Paulette Trotter has been to Welfare Officer of the Howick RSA for almost quarter of a century. It’s a job she has made her own over the years, as the services provided grew as the needs changed. Paulette was always on hand to support veterans, their families and members with a kind word, a hug, or advice on things related to Veterans’ Affairs, Work and Income NZ, home care, funeral arrangements, hospital visits or just a friendly and sympathetic ear. Her support at special club occasions such as Anzac Day, a mark of her commitment to her role and the RSA and the members, especially her ‘oldies”, the veterans. 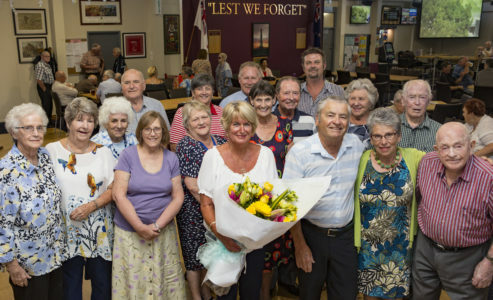 At a special farewell afternoon tea in Paulette’s honour at the Howick RSA on January 31, Madeleine East MNZM, Deputy Chairperson of the Poppy and Welfare Trusts, made a presentation. She noted Paulette’s commitment to the role and her dedication to those who needed support, showing genuine concern and compassion, touching so many lives during her years in the role, not just veterans but their families and other members of the RSA community needing support. Paulette is now looking forward to spending more time at the beach and with her own family as she moves into her much-deserved retirement years.